Exciting card games, which could involve two, there are many. Their selection depends on the taste and age of people. For a younger audience will approach the game easier. For those who like intellectual options, there are also a great choice. It is considered that the card is a gamble. Yes, you can get carried away by them and forget to do some things. But now there are more hazardous and dangerous jobs. Computer entertainment takes many children a lot of time, makes them nervous. If your child sits too long behind a laptop, then distract him with card games. Young will be interesting to play "the Drunkard." Yes, the name is childish, so before you decide grandson, son or daughter to entertain so come up with your own name. Take a deck of 36 cards and distribute them so that each was a stack of 18 pieces. They should lie face down. Consider your wealth is prohibited. The deal, whose first move, if you have, then put the top card of your stack on the table, and little partner. This trick goes to the player whose card is higher. Who was the first to take the whole pack, and he won. The "Fool" can play almost everything, but the French version is not as well known. Deal the cards, starting with partner. You should be 4 and he has 5 pieces. Trump is not open, he's not here. Starts running partner. You must put the card of the same suit or the same value. For example, to the eight of spades can be put 8 of any suit. If you have neither one nor the other, but there is a lady, she is perfect and even give you the right to call any suit. Map such suit should put your opponent. If not, and ladies, take it from the shared deck on top of the map until you see the desired. If you go with seven, the partner must take out of the pack himself 2 cards. Six dooms him to 1 additional ACE makes a pass. The player who first got rid of all the cards. Losers consider their points. The game consists of several rounds, it loses the one who first scored 100 points. If you don't want to bother counting, then spend time together playing a card game "Sun". Place these attributes in a circle in the shape of a large ring, face down. Take turns and place in the center. If there already is a card of the same suit, you have to take them all and play data set. Play together in the card game "Bura". Deal 3 cards to himself and partner, starting with him. Next, the seventh – trump. The task – to collect the first 31 points. Go with one, two or three cards of the same suit. In the last scenario, the chance to score a lot of points, as the second party will be forced to throw all 3 cards. If he can't beat them your own, feel free to take a bribe and attribute points yourself. When scoring in-game "Drill" remember, what is given for: ACE 11, ten 10, king 4, Queen 3, Jack 2 points. For the rest of the card will not earn points. If a person has a big day tomorrow, he can't sleep and is nervous about this, challenge them to a con the other cards. Such a diversion will help him not to worry and fall asleep easily. No wonder the gambling is considered a card, because they have manifested such qualities as intelligence, wit, cunning and speed. It is believed that there are four kinds of card games: family, gambling, folk and commercial. Family and popular types of cards are the most simple and easy to understand most people, they are no complicated moves, everything is quite simple. Very loved game "the fool", which can be played by two to six players. Each of them is dealt six cards, the last card after the deal will be a card of the trump suit. The goal of the game is to get rid of your cards, breaking the little map of the enemy own the older card or the trump card. The player with the card will remain on hand, and losers, who jokingly called "fool". Such games are played by both adults and children, but in gambling or commercial is played only adults, moreover, in several countries over the involvement of the minor is threatened with real imprisonment. 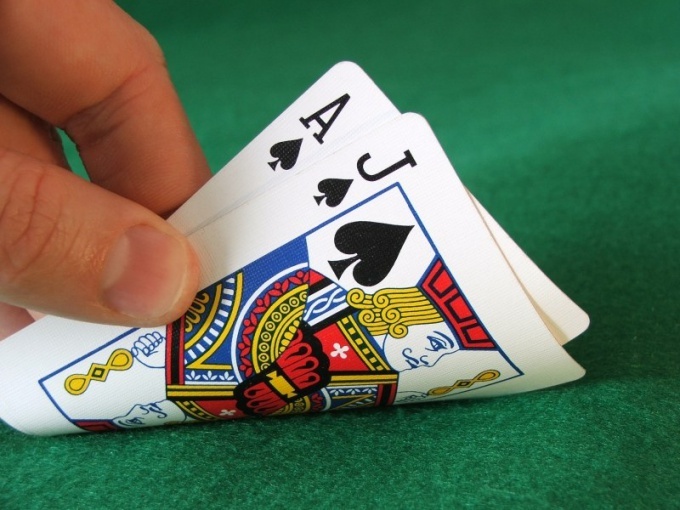 Commercial types include: poker, black-Jack, pontoon, Macau, Ceca and many others. The most popular game of poker, its rules are simple, but the game itself requires attention and logic, because the player needs to build a favorable combination of small number cards. So much so that she "beat" combination of rivals. Each player receives two cards that the opponent should not see, then gradually laid out five cards to all, any player can use them to build combinations. For four rounds, each player makes bets in the total pot, which the winner will get. In the final, the players reveal their cards and the winner is the one whose poker hand will be stronger than others. In many countries of the world there are poker tournaments that annually attracts thousands of fans of gambling. 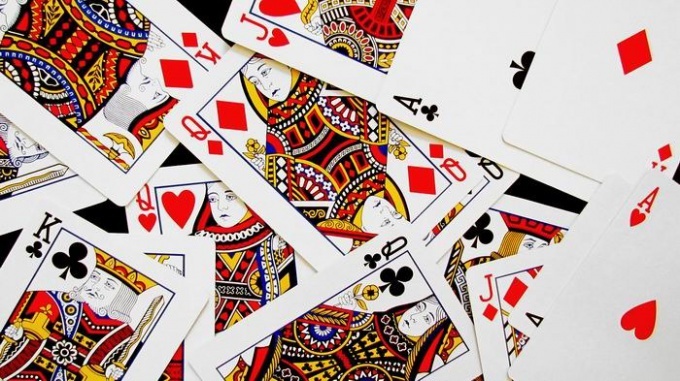 Exclusively to commercial types of card games include bridge, whist, whist, a thousand. All of these types of complex have current rulebooks, which are available even training books and manuals. Such a commercial game, like bridge, is considered the world's only recognized sports game. 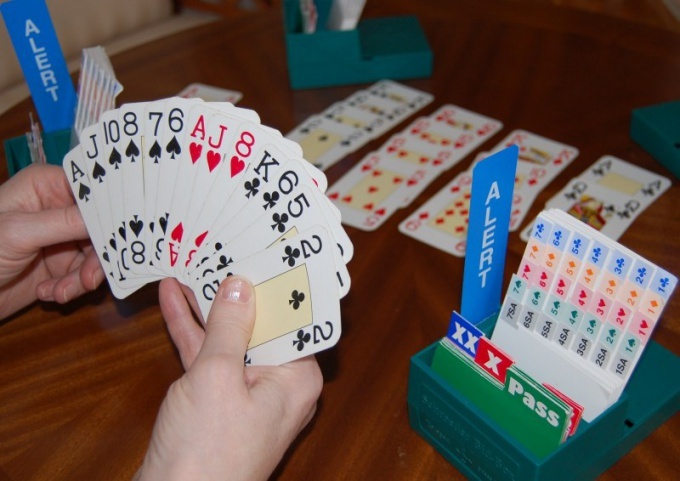 Bridge is played by four players, partners are called players, who sit opposite each other. Even seats at the table have names and are divided into cardinal directions, i.e. South, West, East and North. Do not play in a standard deck of 36 cards, as usual, and a deck of 52 cards. The main task of a couple of players to score maximum points. Playing cards is a set of rectangular pieces of plastic, cardboard or paper with printed images of various motives. They can be used for games, fortune telling or magic tricks. History of playing cards more than four thousand years. It is believed that the most ancient playing cards came from China (unlike Ouija, which appeared in Egypt). In today's world there are more than ten thousand card games and a huge number of varieties and variations. For example, there are over two hundred subspecies of poker, which is currently considered the most popular card game. Playing cards can be made from different materials. The most common is cardboard. Him perform the cheapest cards, but the cardboard deck from good producers can last quite a long time. Card with a thin coating of plastic will last several times longer cardboard, but the most durable are plastic cards. There is and exclusive playing cards with the addition of gold, silver or other precious metals that are usually portrayed to fans of card games special occasions. There are a large number of cards of unusual sizes and shapes. You can find round, triangular, pentagonal cards, and the cards are the standard form, but increased or decreased several times. Such cards are not very convenient to use, but it can be a great gift for the gambler. There are several types of decks of playing cards. In a small deck — 36 cards she used to Vista, of preference, of the king, the fool and other popular games. 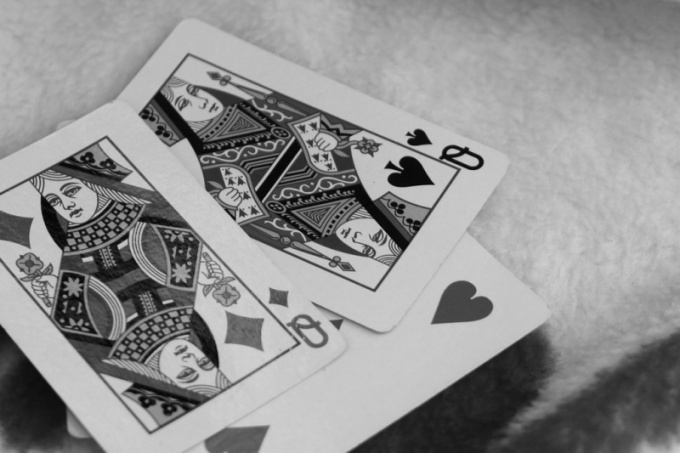 Large deck contains 52 cards and two jokers, it is used for bridge, poker, baccarat and so on. There are a large number modified for specific game decks. For example, a deck for playing pinochle has 48 cards and a set of cards for the Canasta contains two large deck with extra jokers. For the most popular games released a ready-made decks that simplifies the lives of their fans, because not always at hand turns out of the deck with the same shirts to be able to combine them. In recent decades, a large popularity of the game with unique maps that are not similar to traditional playing. These include Magic The Gathering, "Munchkin", "Potions", and others. The rules of these games can be very complex.